A total of 8,940 flats were launched by HDB under the build-to-order (BTO) and sale of balance flats (SBF) exercise in May, with one-quarter of the BTO flats located in the popular mature estates of Ang Mo Kio and Bedok. Property experts are already expecting the BTO flats in these mature estates to be in high demand in this sales exercise for which application closes on May 30. ERA Realty key executive officer Eugene Lim noted that besides their location, the BTO prices are also very attractive, with four-room BTO flats in Ang Mo Kio priced S$150,000 lower to their resale counterparts and three-room BTO flats in Bedok being almost half the price of their resale comparables. 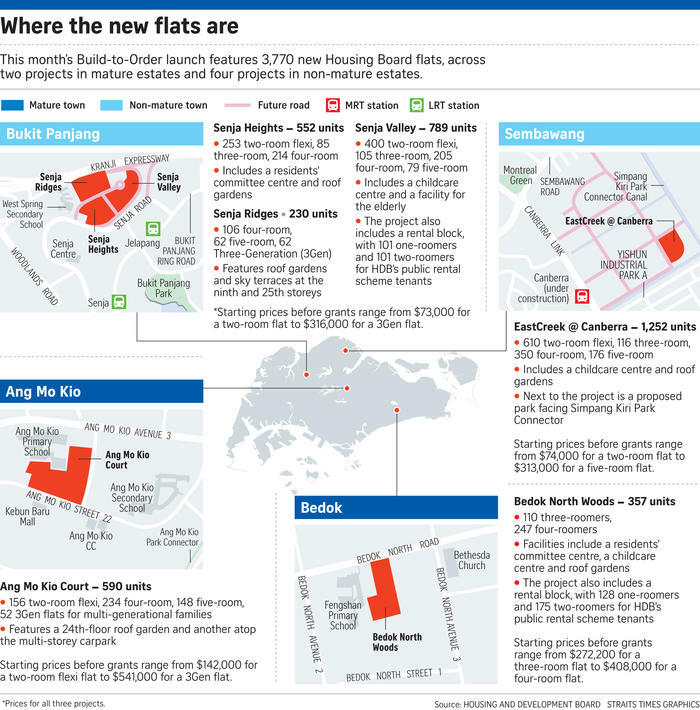 "Given the extremely limited number of flats on sale from Ang Mo Kio and Bedok (947 in total), a good number of financially qualified first-timers who may have family linkages within these two estates are expected to apply for flats there, even though they may be more pricey than similar options in the non-mature estates where there are more flats up for sale and they are more affordable," Mr Lim said. PropNex Realty CEO Ismail Gafoor said he is expecting about four to five applications per unit for BTOs in Ang Mo Kio and Bedok; other non-mature towns Bukit Panjang and Sembawang may see two applications per unit. The current BTO launch comprises 3,770 BTO units across four projects in Bukit Panjang and Sembawang, and two projects in Ang Mo Kio and Bedok; along with this is the launch of 5,170 balance units across 25 towns or estates. As of 5pm on Tuesday, there were 198 applications for the BTO flats, of which 42 applied for four-room flats in the Ang Mo Kio project, 34 applied for four-room flats in the Bedok project, and 36 applied for four-room flats across three projects in Bukit Panjang. Cognisant of the typical high demand in mature estates, Minister for National Development Lawrence Wong encouraged young couples to opt for BTO flats in non-mature estates. In his blog on Tuesday, he said that applicants need to be prepared for a lower chance of success for flats in mature estates given their expected popularity. There are some 2,800 BTO flats in the non-mature estates in the current launch, which are generally more affordable and come with more grants. For example, a three-room BTO flat in Bukit Panjang starts from S$147,000 before grants, or S$77,000 after grants, compared to that in Bedok that costs S$272,000 before grants and S$242,000 after grants. "There's a perception that flats in non-mature estates are located far from work, and are not as well served by transport connections, or other amenities and facilities. But there are significant development plans in many of these areas, which potential home buyers should take into consideration," he said. "Also, our efforts to decentralise our urban development and build commercial centres outside the city will create more investments and jobs closer to homes in these areas." The latest launch brings the total number of BTO flats offered in the first half of this year to 7,940 units. Together with the 5,170 balance flats offered in this exercise, HDB has offered a total of 13,110 flats for sale in the first half of this year. Those 5,170 balance flats are launched across 14 mature and 11 non-mature towns. They comprise 900 two-room flexi units, 1,070 three-roomers, 1,942 four-roomers, 1,168 five-roomers, 77 3-gen flats and 13 executive flats - a flat type which the HDB no longer offers in new projects. About 30 per cent of the balance flats are already completed, while the remaining are under construction. This sales exercise also marks the start of greater priority for second- timer families in public rental flats. They will now be included in the Tenants' Priority Scheme, which sets aside 10 per cent of two-room flexi and three-room flats for families in public rental flats, as well as those applying under the Selective En bloc Redevelopment Scheme, Relocation and Resettlement.